Ayurveda is the knowledge that helps an individual lead a healthy life by the use of lesser-known techniques and medicinal herbs. This thousands year old secret to a healthy life is still as prevalent and has been helping individuals gain healthy immunity to fight off diseases. Ayurveda is an individualized system of traditional medication which means what is beneficial to others might not be as effective for you. That's why a good and continuous practice of Ayurveda is important to help differentiate between different body types and provide respective solutions. Ayurveda course is a well-detailed insight into the preservation system for health by attaining required immunity. Ayurveda helps establish balance and harmony into the body through nutrition, meditation, herbs and a well balanced daily routine. The science of Ayurveda provides an individual with the knowledge to acquire the reality well past the physical dimension while achieving harmony for the body, spirit, and mind. It is a completely natural system for health care. Ayurveda offers different types of body massages with the help of herbal oil for removing the excess fat from the body. It offers everything that you would prefer a better treatment to control and eliminate obesity. Thus, those who undergo the Ayurveda weight reduction program will surely notice its effectiveness in reducing the excess fat accumulation in the body. Ayurveda offers a safe and effective weight reduction. The program ensures that you get a controlled Ayurvedic vegetarian diet, combined with massages by using herbal powders and oils to lose body weight. The Ayurveda Weight Reduction Program assures one of the most genuine metabolic changes. You get an exclusive and personalized treatment depending on your body type and need. The Ayurveda Weight Reduction Program is carried out in its most authentic form, supported by Yoga and meditation sessions. Stress is a psychological experience that affects the body and mind profoundly. A prolonged stress offers negative effect on the body altogether. Thus, we need to undergo appropriate measures for stress management, or else it may lead to serious complications like violence, heart attack, stroke and some other issues. Stress management refers to the process in which techniques are executed to counteract with various stressful conditions and offer a sense of serenity and relaxation in return. Ayurveda therapies help to reduce stress, depending on the body condition of the person. The stress management Ayurveda package help to remove excess fat accumulated in the body. It helps to enhance proper digestion. Rejuvenates the mind, body and soul and tones up the skin. Prevents diseases and strengthens all the systems in the body to achieve sound health and longevity. Helps to improve mental vitality and health. The Rasayana package is designed with the aim of rejuvenating the mind, body, and soul and to restore the vitality of the body by eliminating toxins through some traditional Ayurvedic treatments. It also helps to enhance the body’s immunity and strengthen all the systems to achieve the ideal health and longevity. The Rasayana therapy helps to arrest premature ageing. It enhances the memory, strength, youth, and sweetness of voice. Improves the metabolic processes that help to eradicate senility and another disease of old age. It helps to build a natural resistance against infection. Nourishes the blood, lymph, skin and thus helps to prevent degenerative changes and illness. The Ayurveda 25 day treatment packages help to revitalize and detoxify the body thus purifying it and making you feel completely fresh and rejuvenated. The Ayurveda therapies help to prolong lifespan, increase physical endurance, improve the memory, and maintain perfect health and youthfulness. Abhayangam: It is a popular Ayurveda body massage that helps in conditioning the body. Sneha Panam: A medicated Ghee gave to improve the digestion of the person. Udwarthanam: A special therapeutic massage in which herbal powders are used to massage the body. Vasthi: Vasthi is a treatment that helps to eliminate toxins in the digestive tract. Dhanyamla Dhara: It includes pouring of medicinal liquid over the different parts of the body. Podi Kizhi: A type of Ayurvedic massage in which herbal powder is used. Licensed Ayurvedic health care providers use the benefits of natural herbs together in an organized fashion to help the patients attain a healthy and happy body. From food to massage, Ayurvedic treatment involve maintaining the imbalance of three doshas known as the Vata, Pitta and Kapha Dosha. This Ayurvedic massage technique involves two therapists who use a variety of herbal oils which are medicated in nature. Our therapists use numerous strokes and varying degree of pressure depending on the body type of the individual. A total of 45 minutes is dedicated to this Ayurvedic massage style which when applied in a regulated pattern on a daily basis helps prevent ageing as well as body degeneration. The rhythmic motions used by our therapists in this ayurvedic massage helps decrease stiffness in the body while allowing free movement. Prevent wrinkles and maintain skin texture. With a perfectly balanced use of herbal powders, Udavartanam massage provides a special kind of deep tissue massage that hails some major therapeutic effects on the body. The word Udavartanam massage roughly translates to elevating or promoting. Our Ayurveda therapists apply an upward stroke to the body to provide full benefits of the massage. The massage treatment involves the therapist warming up the herbal powder which is applied to the body with strokes that is opposite to the direction of growth of the hairs. This procedure is done in seven different postures with duration of at least 45 to 60 minutes following which the person has to rest for at least 30 minutes. Provides lustre to the skin. Reduces weight by removing excess fat. Useful for conditions such as Muscular dystrophy, Multiple Sclerosis, obesity..
Reduces the cholesterol level in blood. 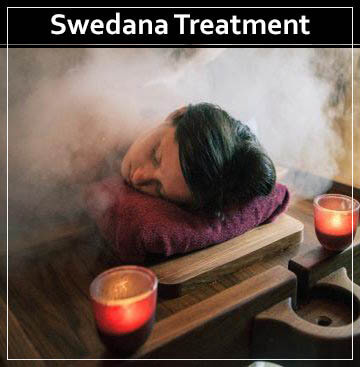 As explained in Ayurveda, Swedana is a treatment that involves steam. 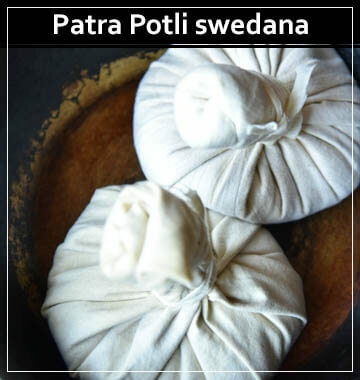 To simplify it, Swedana is the process of making the person sweat by the use of steam that is generated from heating up medicated herbal mixtures. Our expert therapists use this Ayurvedic treatment as a pre-operative process to dilate the channels of the body that helps remove toxins before a massage therapy is started. Expels toxins from deep within the body through tiny pores on the skin. Increases blood circulation while rejuvenating the skin. Brings down the numbness, heaviness and increases the mobility of the body. Helps with back pain, Asthma, Sinusitis. This particular massage technique involves using herbal left which is majorly effective for ailments related to bones, nervous system and joints. In this process, our therapists collect fresh leaves that contain Vata decreasing properties like tamarind or drumstick. This Ayurveda therapy starts with Abhyangam massage followed by massage via warm boluses. The boluses should be no more than 46 degrees or no less. After the process is complete, our therapists cover the body with a thick blanket for at least 30 minutes. The final part of this process is a hot shower. Reflects better skin with reduced ageing. Helps with Arthritis, Sciatica, sports-related injuries. This Ayurvedic massage treatment is done to induce sweating while improving the overall muscle strength. Our therapists use milk and rice, combined to provide therapeutic effects which provide nutrition to the body and especially the soft tissue and bones. A special concoction of milk along with rice paste is rubbed against the body to provide heat to the areas with pain. Brings down the symptoms of neuromuscular diseases. Reduces Vata and Kapha Dosha. Helps with low back pain. Nasayam is an Ayurveda practice that focuses on the installation of numerous herbal medicines via the nostrils. The benefits associated with the Nasayam Ayurvedic treatment are very diverse. The Nasayam therapy when provided by our expert therapists helps in removing mucous clogs, clearing channels inside the head and stimulating the central nervous system in the brain. Brings down the effects of Parkinson’s disease. Increases the immunity and makes the sensory organs stronger. 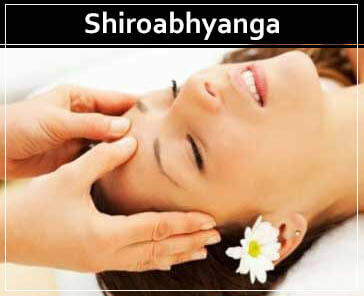 Shiroabhyanga is used to reduce mental fatigue by bringing clarity to the mind. This ayurvedic massage provided by our excellent therapists has a calming effect on the brain and nerves along with the sensory organs. 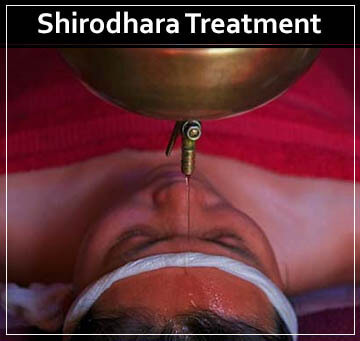 Shirodhara is one of Ayurveda techniques used in Panchakarma where our therapists gently pour the lukewarm herbal concoction into the forehead. The name itself signifies the therapy as Shiro means head and dhara means flow. Reduces the onset of depression. For people who spend a lot of time sitting on a chair in the office, Kati abhyangam massage is highly beneficial to treat the stiffness arising from the same. Our therapists provide this Ayurvedic treatment by using different herbal oils on the back, shoulder, and neck in a series of strokes with varying pressure points. This particular Ayurvedic treatment helps you connect back with the Earth as you put down wholly rejuvenated feet back on the ground. With lukewarm herbal oils, our therapists massage the entire foot region to eliminate the toxins from the body. Removes stiffness from muscles in the feet. These are the numerous Ayurvedic approaches followed all over India instilled by professional therapists. With a hectic lifestyle, taking care of oneself is almost impossible, but Ayurveda helps you remove all the negativity from the body while increasing the overall immunity to fight.